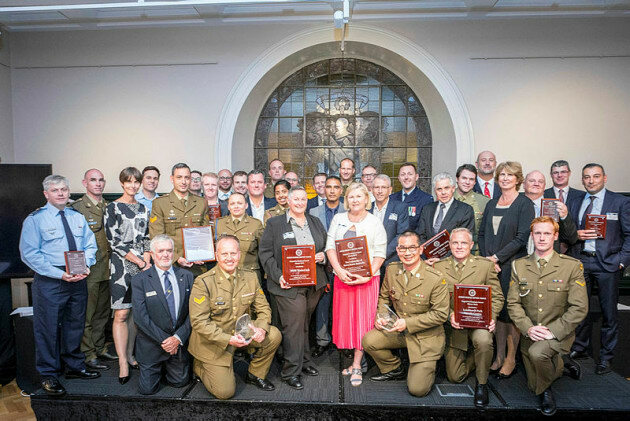 Employers from across New South Wales were recognised for their support of ADF Reservists at the Defence Reserves Support Council’s annual Employer Support Awards event in Sydney. The ceremony, hosted by the NSW Defence Reserves Support Council (DRSC), recognised employers who have actively supported their ADF Reservist employees within their civilian and military workplaces. Acting state chair of DRSC NSW, James Digges, said the event highlighted the strong support so many employers across NSW are giving to reservists. “Without the support of their employers these reservists and many others across the Defence Force would be unable to fulfil their Reserve duty, that is vital to the success of the Australian Defence Force,” Digges said. Head Reserve and Youth Division, RADM Bruce Kafer, said the employers acknowledged at last night’s awards ceremony have all been nominated by their employees. “It is a huge testament to these businesses to be acknowledged by their staff members as an employer of choice,” RADM Kafer said. Other businesses formally recognised included Leichardt Park Aquatic Centre, Sydney Trains/NSW Trainlink and Westpac Bank. The awards ceremony was also opportunity for employers to learn more about the programs offered by Defence Reserves Support, to gain a better understanding of the many roles reservists undertake in the ADF, and to learn how their reservists’ military skills are transferable to their civilian workplaces.